In late December 2010, Ted Ligety met up with three friends, including professional freeskier Marcus Caston, in his hometown of Park City, Utah, and the four trekked into the Wasatch backcountry to build an 80-foot gap jump. The timing was odd. Ligety, a World Cup ski racer who, at that point, had won a gold medal at the 2006 Olympics and two overall World Cup giant slalom (GS) titles, had just come off his most successful month of racing, winning three straight events. Spending the day risking serious injury by hucking his meat off a kicker, potentially putting an end to his already dominant season, seemed, well, dumb. After spending two hours crafting the jump over an old mineshaft located on a narrow strip of powder between the Deer Valley and Park City ski areas, Ligety hiked up the 35-degree pitch, dense with trees, and pointed his skis down the hill. “I was nervous,” says Caston. “I was like, ‘oh my god, I cannot kill Ted Ligety.’” But, Ligety wasn’t worried. “It was powder,” he says. “If I landed on my head it’d just feel like I was landing in pillows.” He pushed off, went tearing toward the jump at about 35 miles-per-hour, front flipped off the lip and soared 50 feet high in the air, landed and skied to a stop. Then he spent the rest of the day repeating the feat. 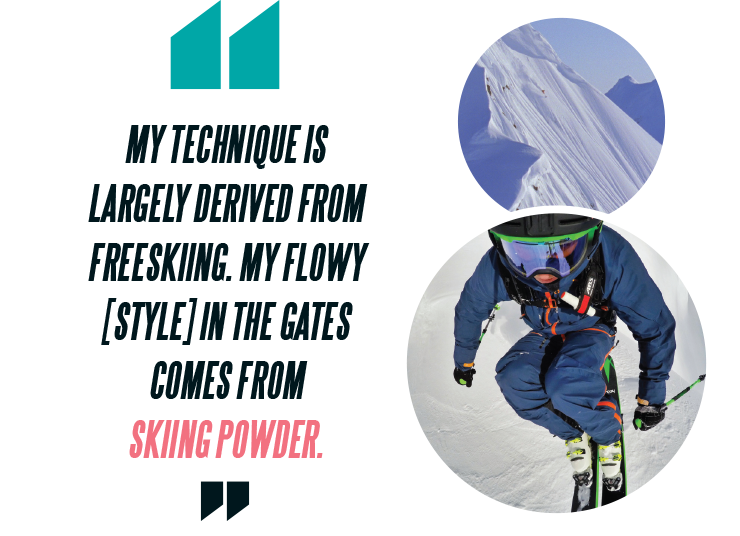 For Ligety, getting out from between the gates and off-piste isn’t unusual. In fact, it’s crucial. Two years earlier, over six feet of snow pounded the Italian Alps a week before a big race in Alta Badia. Instead of riding out the storm in his hotel room, Ligety broke out his powder skis, headed to a 60-foot-high cliff band and took flight. That was met by disapproval from some US Ski Team members who questioned why Ligety, who was leading the World Cup GS standings at the time, would put his season in jeopardy. That’s always been the case for Ligety. Growing up, he attended the Winter Sports School in Park City, a high school that allows athletes who compete in winter sports to go to school during the summer, opening up their winters to train and compete. His approach to racing was unique. While many junior ski racers prioritized tuning skis and seeking out feedback on performance and technique, Ligety would hunt for powder stashes and pop knolls after training or between race runs. When he did find time to relax, Ligety would hang out with classmate Tanner Hall, the seven-time X Games gold medalist and freeskiing pioneer, and watch videos of skiers performing mind-blowing tricks or straightlining down consequential mountain faces. Nonetheless, ski racing remains Ligety’s primary focus. Since his backcountry front flips, he’s won three more overall World Cup GS titles (for a total of five), five World Championship titles and the gold medal in GS at the Sochi Olympics in 2014. He has, however, carved out some time for more freeskiing. Five years ago, Ligety, Caston and Phil Meier, a Swiss freeskier, traveled to Alaska, to the Chugach Range, to heli-ski. For Ligety and Caston, it was their first time skiing the famed Alaska lines. The first day there, the trio flew to the top of a steep spine and asked to be dropped off. “We didn’t know anything about rollovers or slough,” says Caston. “It was intimidating.” Meier skied first and, just a few turns in, triggered a massive avalanche that he survived by deploying his airbag. This hard shell helmet utilizes Shred’s patent-pending RES technology, which features multiple discs that move ever-so-slightly between the head and the helmet to combat the effects of rotational impact energy on the brain. The RES build is complemented by Slytech NoShock—a foam, honeycomb-shaped structure that disperses linear impacts for even more protection from slams, big or small. The Amazify is a cylindrical-lens offering with a gigantic field of view, and what a view it is… Shred’s Contrast Boosting Lens technology provides exceptional visibility in all terrain and conditions while its NoDistortion technology equalizes pressure between the lens and outside conditions for distortion-free visual clarity. This thin, light and flexible protective vest is designed for maximum mobility. It’s built with Slytech 2nd Skin XT, a hexagon-patterned foam that molds to the user’s back and intelligently adapts to different forces and speeds of impact.